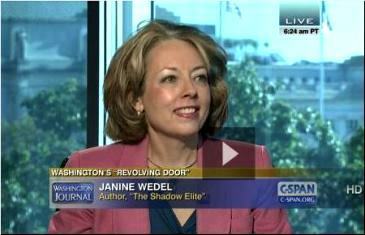 – C-SPAN, Washington Journal, "Washington's Revolving Door", interview, September 14, 2013. 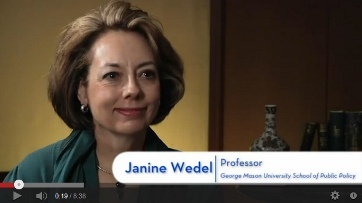 "Janine Wedel, author of Shadow Elite: How the World's New Power Brokers Undermine Democracy, Government, and the Free Market, talked about the impact of a new class of Washingtonians she had named "flexians." She said that these power brokers move seamlessly between roles of business consultant, think-tanker, TV pundit, and government adviser in ways that the average citizen could not track. Therefore they can not be aware of biases or conflicts of interest." – Institute for New Economic Thinking, "Behind the Scenes of International Banking Regulation, interview, January 8, 2013. Watch it on YouTube or on Institute for New Economic Thinking site. – Freie Universität, Berlin, "Cultural Entrepreneurship Conference on "Ethics, Finance and Politics." 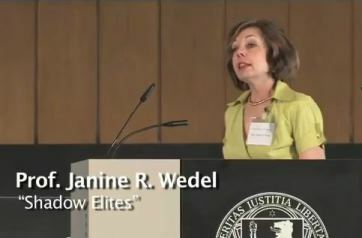 Presentation on "Shadow Elites", May 19, 2011. Watch on YouTube: part 1 and part 2. – TEDxBerlin 2010, "Shadow Elites" presentation at the "Fantastic Reality: How We Shape our future" symposium, Berlin, Germany, November 15, 2010. Watch it on YouTube or on TED site. – Russia Today TV, "Cross Talk on Forbes Most Powerful: Who is Hu?" with Peter Lavelle, November 12, 2010. – C-SPAN, "Private Contractors & National Security" Washington Journal, July 24, 2010. – PBS, "The supranationals: a new kind of elite." 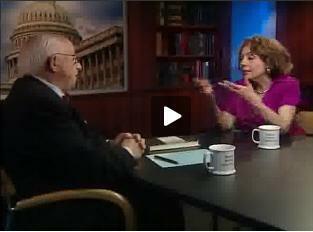 "White House Chronicle" with Llewellyn King, July 23, 2010. – Al-Jazeera Television, "Empire - Superclass," July 29, 2010. – Janine Wedel discusses impact of Supreme Court decision. MSNBC, "Dylan Ratigan Show," January 28, 2010. – Huffington Post, "'Shadow Elite' Live Video Event." with HuffPost Washington Bureau Chief Dan Froomkin, January 28, 2010. – Russia Today TV, "Cross Talk" with Peter Lavelle, January 21, 2010. – Al-Jazeera Television (180 million viewers), "The Riz Khan Show," December 16, 2009. - Part 1; - Part 2. – KPFK 90.7 FM Pacifica Radio, "The Insighters" with Maria Armoudian, May 22, 2011. – Radio Free Europe/Radio Liberty (RFE/RL) "The 'Shadow Elite,' WikiLeaks, And Living In A 'Dangerous Era'", August 16, 2010. – XM 130/SIRIUS 110, POTUS satellite radio "Stand UP!" with Pete Dominick, March 22, 2010. – WAMU 88.5 FM American University Radio, "An Ethically-Challenged Capital City?" The Kojo Nnamdi Show, March 11, 2010. – WZBC 90.3 FM News in Boston, "Sounds of Dissent" with John Grebe, February 13, 2010. Listen to part 1 - starting after 51 min. into the program. Listen to part 2 - continuing for 32 min. longer. – KPFK 90.7 FM Pacifica Radio, "Daily Briefing" with Ian Masters, February 07, 2010. The interview starts after 1:05 hour into the program. – CPN, Charlottesville Podcasting Network, "Charlottesville—Right Now!" with Coy Barefoot, January 28, 2010. Listen to the podcast. – KOPN 89.5 Community Radio for Mid-Missouri, "A Chautauqua" with Deb Hobson, January 14, 2010. – News Talk Radio 77WABC, "The John Batchelor Show," December 26, 2009. – KPFK 90.7 FM Pacifica Radio, "Daily Briefing" with Ian Masters, December 20, 2009. – KSFR 90.7 FM Santa Fe Public Radio, "The Journey Home with Diego Mulligan," December 16, 2009. – Progressive Radio Network (P.R.N. ), "Gary Null Show," December 15, 2009. – KVON 1440 AM, "Late Mornings with Jeff Schechtman," December 15, 2009. – Air America, "The Lionel Show," December 3, 2009. – KPFA 94.1 FM Pacifica Radio, "The Morning Show," November 30, 2009. – 680 WPTF, NC's "Morning News" with Scott Fitzgerald, November 23, 2009. – KPFK 90.7 FM Pacifica Radio, "Daily Briefing" with Ian Masters, November 10, 2009. – Program in Contemporary European Politics and Society, Princeton University, Cosponsored by the European Union Program. December 4, 2012. See the flyer. – Anthropology Colloquium, Georgetown University, November 10, 2010. – Bruno Kreisky Forum for International Dialogue, Vienna, Austria, October 27, 2010. – 2010 Fall for the Book Festival, George Mason University, September 21, 2010. – UCIrvine Forum on the Anthropology of Public Policy. Social and Behavioral Sciences Gateway (SBSG), April 1, 2010. – McNally Jackson Bookstore, 52 Prince St., NY. March 22, 2010. – Kennan Institute/Wilson Center, January 19, 2010. – Barnes & Noble, NY (Upper West Side), January 13, 2010. – Politics and Prose, January 8, 2010. – New America Foundation, Book Launch, December 1, 2009. "…throws light on how power brokering… undermines our government and democracy itself." Vanity Fair, Dec. 2009; p. 114.